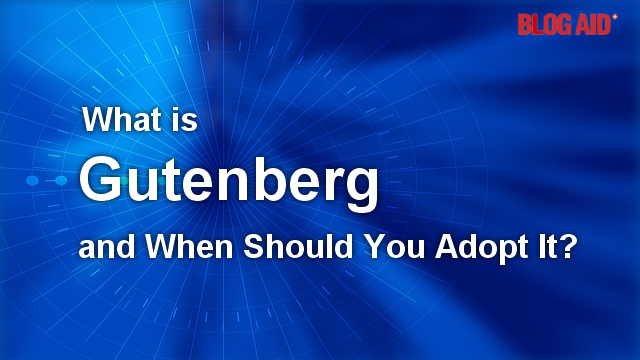 Discover what Gutenberg is and more about the coming internet revolution. I believe that in just a few years the hard screens we use now (monitors, tablets, and phones) will be replaced by virtual screens. Keyboards and touch interfaces of all kinds will be replaced too. Instead, we’ll be talking to our interface rather than typing or clicking on it. And, I believe that we will have more control over where different aspects of sites are displayed to us, instead of solely relying on the intended layout. In other words, all content types will be where we want them to be placed in our virtual space. WordPress has elected to call each content type a Block. Your site navigation Block might be labeled Menu. Where it appears to a site visitor will be initially controlled by your intended layout, or theme. But, it will also be available as an independent content segment to be placed by the visitor where they want all menus from all sites to appear in their virtual world. For instance, if they want menus of all sites in the top left of their virtual space, your site’s Menu Block will appear in that place for that visitor. Every visitor will be able to customize their internet experience to their liking. Eventually, every element on a WordPress site will be built in segments. That includes the theme design itself. But, that’s a big adjustment, and too much of a development and learning curve to take on all at once. So, to help everyone become familiar with segmenting different content types into Blocks, and move us all toward another way of thinking about site layout, the developers at WordPress decided that the first step in the whole Gutenberg revolution should be to create a set of Blocks in the area that site owners create and update the most, which is their page and post content. And we do that content creation in our Text Editor. That’s why the Gutenberg Text Editor is the first piece of a bigger rebuild of the WordPress CMS that will eventually be followed by other pieces, phasing in a whole other way to create sites. Those content types can easily be broken into Blocks. Currently, we add a whole page of text content and upload images and add other elements throughout. But, with the Gutenberg text editor, you’ll first select a Block type, and then add the appropriate content to it. For example, there is a Title Block. And then another Block for an image. And a Block for a Heading. And then another Block for a paragraph of text. Most site owners can create a whole post with just those four Blocks used over and over. But, there are many more Block types available. In fact, there are 100s, and more are being created by plugin and theme developers every day. So, you will have a Block for just about any type of content that you create now. Each Block can have styling applied to it. Most of that styling will be controlled by the theme, just as it is now. For instance, the look of the font in your post/page paragraphs is controlled by your theme. The font for your H1 and H2 headings is controlled by your theme now too. Your theme will just control the content element inside the Block you use, like a Paragraph or Heading Block. Currently, you can also override any font on your site with what’s called inline styling. So, if I want to make a few words bold red in my content, I can easily do that. With Gutenberg Blocks, you can take inline styling to an extreme. You’ll be able to style an entire paragraph Block differently. You can change the font, background color, put a drop cap on the first letter (making it bigger), and so much more. Many designers started screaming about giving site owners too many style choices like this, as they know inexperienced site owners will tend to make their content look like a circus and destroy the cohesive look of the theme. The whole purpose of a theme’s CSS file, which contains all of your theme’s styles, is to load it once, and then have it cached on the visitor’s browser, so subsequent page loads, or repeat visits are faster. With inline styling, the page itself has to be read more carefully by the browser, and all of those new styles executed each time they appear. Too many styling options is not always a good thing. While more Blocks, and styling for them, are being created every day by both theme and plugin developers, there is no guarantee that a Block type you need will be available, or that your current theme will handle a Gutenberg Block styling gracefully at this early stage of the changeover. Block and styling incompatibility, coupled with the fact that WordPress 5.0 represents only the first step with Gutenberg code in the core, is why I advise site owners to delay making use of Gutenberg until it matures. You may be better served by waiting for your current theme and plugins to become fully Gutenberg compliant, or switching to a new theme that is fully compliant, if it offers all of the functionality you need. And it’s not just the Blocks. Some page attributes and formatting options are not even available, or are radically different than those in your current theme. For example, blockquote, the new pull quotes, and citations code/styles can be in conflict with one another, depending on your theme. Some page templates available in your current theme may or may not even be available or work well with Block styling. Gutenberg Times has a running list of plugins that are either Gutenberg compliant or not. Be sure to pay careful attention to the list of compatible plugins. Many are only listed as compliant because they are not yet making use of Gutenberg. That will change. Personally, I’m waiting for every plugin I use that has a public-facing component, to become fully Gutenberg compliant before I consider switching to a Gutenberg compliant theme. In other words, I suggest waiting until you can make a full switch before using any part of Gutenberg. Due to the outcry from designers and developers, and the legitimate concern of site owners who have highly customized themes, WordPress has made it easy for us to opt-out of using the Gutenberg Text Editor when it rolls into the core with the release of version 5.0. There are also plugins from other developers that will help us put Gutenberg on ignore as well. These options will allow us to continue using our current themes and plugins just as we do now. Some themes and plugins developers may elect to go all in and make their wares Gutenberg compliant only. One of the reasons for that is because it may be too difficult to support both text editors in one plugin or theme. Some developers may elect to offer a legacy or classic version that is non-Gutenberg compliant. But the bottom line is, it’s time-consuming enough to keep one plugin or theme up to date. The time and money expense of supporting two versions may become untenable. That’s especially true of all the plugins we are able to use for free. For many developers, there is no financial incentive to do a major overhaul, or create a second version of the plugin from scratch. Add to this the fact that many plugin and theme devs are already having to do an overhaul to be PHP 7.x compliant. And many have elected to drop support for older PHP versions. And that also could mean a complete rebuild of the plugin from scratch. All of that is getting super costly for devs. I’m betting we will see an extensive clearing house on free plugins and themes over the next two years, as many of them begin to fall way behind in current and future standards. The Gutenberg revolution represents just one more reason to get a site audit now and ensure your site, plugins, and PHP level are up to par, and that you are not using any more plugins than you absolutely need. The Gutenberg Text Editor is just the start of the revolution that is coming to WordPress, and eventually to all sites. Every element of your site will eventually become a Block. And theme creation may get stood on its head even more than the page builders we have now allow. It will only be a few more years before virtual, augmented, and mixed reality become the norm, but it will become the norm. Voice search is already taking hold and it will only be a few more years before talking to all devices is the norm. The technology already exists to make all of this a reality. Making it cool and affordable is just a matter of time. The same thing happened with cell phones, and look what has become of that revolution. For existing site owners, I advise waiting to make the switch to Gutenberg until it, and plugins, and themes mature. If you’re serious about making money with your site, then seriously consider that we already have enough changes with everything connected to it to keep you busier than you want to be with site tech now. Gutenberg is in its infancy. If you want to add constant change and quirks and such to your current site, then go ahead and switch. If you want to avoid the chaos of breaking in a new puppy, then hold up a bit. You aren’t missing a thing by not using Gutenberg just yet – or likely for the next year. However, if you are starting a brand new site, and your theme and plugin needs are super, duper simplistic, then maybe you are better off starting with Gutenberg. There are already several fully compliant Gutenberg themes. Right now, they are definitely more about function than fashion. So don’t count on getting something very pretty. Or, you could use the theme of your choice, and grow with Gutenberg as it expands over the next couple of years, mess, chaos, and all. Using the Gutenberg Text Editor will not likely break your site. You just may not be able to use all of the functionality of your theme and plugins. WordPress 4.9.8 is slated to have an invitation to try the Gutenberg plugin. I advise simply turning that invitation off. You’ll be able to try Gutenberg when it roles into the core in version 5.0, which will likely be released within a month of 4.9.8. Thanks for this, MaAnna. It is so clear, even I can understand it!! Your clear cut, non geeky-speaky style is logical and easy to follow. And your advice is very helpful. Thank you for all the time you invest in researching and writing. As one of “your peeps” I appreciate this so much. Thanks for this MaAnna. I am starting a new WP for someone which will not have much on it at all and won’t be seen by the public. Only a few pages and no posts. Will only be using a handful of plugins and the ones I am using now with it seem ok. This will certainly be an interesting venture for all of us who have established WP sites to see how they will convert to the new system. Yeah, for a super simple new site, Gute might be the way to start with it for sure. Excellent article! Thank you for making this all feel doable! You’re welcome Robin!! We’re all going to try to get through this the calmest way possible.